Mindfulness involves two primary components: self-regulation of attention and non-judgmental awareness....As MBIs promote flexibility (Kashdan & Rottenberg, 2010) and self-reflection, they may be well suited for helping teachers overcome the tendency to make automatic, reactive appraisals of student behavior that contribute to emotional exhaustion (Chang, 2009). Thus, developing greater mindful awareness may support both effective classroom management and caring (Jennings et al., 2011, p. 38-39). As academic achievement becomes narrowed into a single-minded obsession with test scores, what possibilities remain for ethical, caring teachers to hone their craft and inspire their students with the joy of learning? In The Mindful Teacher, authors MacDonald and Shirley begin by articulating the prevalent problem of “alienated teaching”—the kind of teaching that teachers perform when they must comply with external conditions that they feel do not serve their students well. 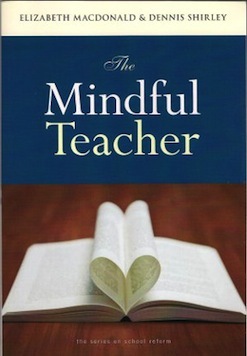 As a solution, the authors propose “mindful teaching” —the kind of teaching that is informed by contemplative practices and teacher inquiry. They identify “seven synergies of mindful teaching” —strategies that teachers can use daily to integrate more reflection and attunement into their busy classroom life. Check out the The Mindful Teacher website! Programs for Teachers, Educators, AdministratorsCourage in Schools programs, retreats, and workshops are designed to help educators renew themselves and translate personal transformation into the transformation of their schools and institutions. We offer educators opportunities to reflect on the inner dimensions of teaching and leading and to increase their capacity to listen to self and others more deeply. Participants join with fellow educators to engage in honest self-reflection and explore questions about purpose, values, and commitment to their challenging work. September 16, 2013 Garrison Institute Blog Post: "Incorporating Mindfulness Training into Teacher Education"